Rosenberg's redesigned and improved GD84 500-Watt, 230-Volt single phase EC motors can increase airflow and pressure output by 2% to 5% depending on the fan model. Rosenberg's new GD84 500-watt EC motor improves HVAC fan performance. ...higher efficiency electronics offer a significant decrease in nominal current. Rosenberg's redesigned and improved GD84 500-Watt, 230-Volt single phase EC motors run cooler and more efficiently, while increasing airflow. They are available now on Rosenberg axial and backward curved fans for HVAC and equipment cooling applications. 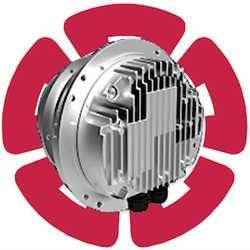 The new UL-recognized motors increase airflow and pressure output by 2% to 5% depending on the fan model. Features of the GD84 motor include higher efficiency electronics that offer a significant decrease in nominal current. An improved housing design features an integrated, highly efficient heat sink for improved thermal management. Standard input voltage is 200 to 277-Volt single phase in 50-60 Hz frequency. 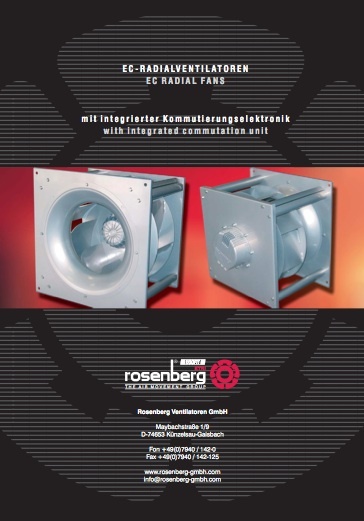 In addition to standard products, Rosenberg builds fans and motors to specific customer needs such as special finishes, voltages or frequencies. Rosenberg’s electronically commutated (EC) motors provide easy speed control, long life expectancy and low operating costs. They are CE-approved and meet ErP 2015 requirements. Rosenberg USA is located just outside Charlotte in Indian Trail, N.C. For more information, or to place an order, contact Rosenberg USA by phone at (704) 893-0883; fax (704) 882-0755 or e-mail sales(at)rosenbergusa.com.